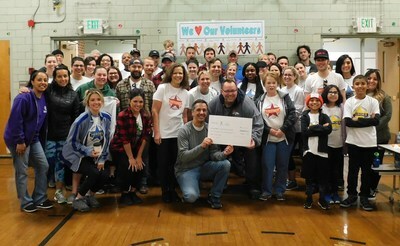 DENVER, April 19, 2018 /PRNewswire/ -- University of the Rockies, along with parent company Bridgepoint Education and sister school Ashford University, completed a beautification project for Valverde Elementary School on April 14, 2018 as part of its Heroes Day organization-wide service projects. Thirty-five employees and their friends and family members joined with Valverde Elementary School staff and completed several projects to enhance the physical school environment. Projects included cleaning each classroom, cleaning the library, painting the inside handrails and stairwells, adding mulch to the grounds, and installing an outside art project. On hand to welcome the volunteers was Angela Cobian, Denver public school board member and Drew Schutz, Valverde Elementary School principal. Dr. Dawn Iwamoto, president and CEO of University of the Rockies and Dr. Theodore Blashak, regional vice president of shared services operations, Bridgepoint Education, presented a check to Valverde Elementary as additional support. "Valverde has come a long way, and our partnership with University of the Rockies, Bridgepoint, and Ashford University has been a significant part of our progress the last few years," said Schutz. "We truly appreciate their support and for being here today for Heroes Day!" Cobian stated, "We know that in this moment the gap between those who have the most and the least is the widest gap it's ever been. Our schools are a microcosm of our country, and are at the frontline of this gap. Partnerships like this provide a level of support that our schools both need and deserve." "This is our second year partnering with Valverde Elementary on Heroes Day," said Dr. Iwamoto. "We are thrilled to support elementary education and serve the students and staff of this wonderful school." University of the Rockies and Ashford University also support Valverde Elementary throughout the year though TutorMate and Power Lunch literacy programs, supply drives, and by supplying uniforms for students. Where heritage meets innovation – that's Ashford University. At Ashford, students discover relevant degree programs, innovative technology, and cherished tradition. Ashford offers associates, bachelor's, and master's degree programs online, allowing students to balance life by providing the flexibility to do school work anywhere, anytime. For more information, please visit www.ashford.edu, www.facebook.com/ashforduniversity, www.twitter.com/AshfordU, or call Kathleen Park, Public Relations and Social Media Specialist,at 858.513.9240 x11636. Bridgepoint Education, Inc. (NYSE:BPI) harnesses the latest technology to reimagine the modern student experience. Bridgepoint owns two academic institutions – Ashford University and University of the Rockies. Together, these programs, technologies, and resources represent a unique model for advancing education in the 21st century. Bridgepoint stands for greater access, social learning, and exposure to leading minds. For more information, visit www.bridgepointeducation.com, www.facebook.com/BridgepointEducation, or call Kathleen Park, Public Relations and Social Media Specialist, at 858.513.9240 X 11636.